Covert Cogs Miss Ariel Knapp and Mick Tindale are on the case. As agents of The Allegory Society, they are called in when mechanical behemoths rob a bank, because the men of the Chicago Police Force aren’t equipped to handle machines run amuck. Pinkertons wants nothing to do with them either! In this fast-paced Weird West Steampunk adventure novella, Ariel and Mick resort to some weapons that other Cogs might overlook, the Society issued blasters with their impressive arcs of electricity being the more impressive item in an operative’s assessor cache. With the zappers having little effect on their opponents, much less conventional six-guns or knives, this daring duo take matters into their own hands, along with toys, ranching, circus, and kitchen items to best their adversaries. 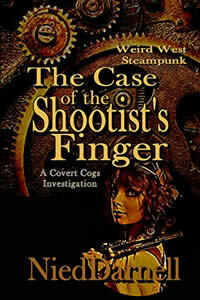 THE CASE OF THE SHOOTIST’S FINGER is the first in a series of novellas following the adventures of different Covert Cogs, all running up to a trilogy of novels that really puts the spit in the fire.